Two weeks ago, I noted that Netflix was accessible over IPv6. At the time, it was only their website, not their streaming service. Today, at NANOG 46, Netflix announced that their streaming service now supports IPv6. 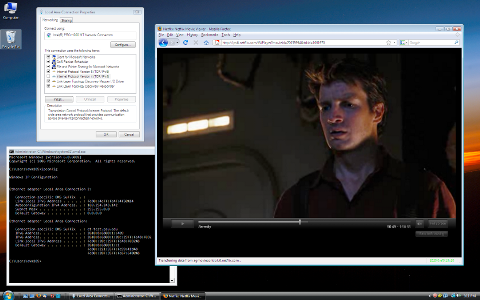 Here’s a screenshot of my Vista box running IPv6-only and streaming Serenity. Notice that there’s no IPv4 address on the box. There were several interesting bits in Netflix’s slidedeck. Their Content Delivery Network, Limelight, announced IPv6 support today. This is huge, as they’re the first CDN to announce production IPv6 support. Lack of IPv6 support in CDNs has been cited again and again as a primary factor in not deploying IPv6 on large content sites. IPv6 is easy. On Netflix’s end, the entire deployment, from idea to production service, took two months. Limelight only tasked two engineers to work on IPv6 support. “Load Balancers are easy.” Alleged lack of IPv6 support in loadbalancers is a common canard that’s totted out again and again when folks talk about production IPv6 deployments. I was so glad to see a large Internet content provider dispel this myth. Netflix even posted sample config for IPv6 on a Citrix Netscalar in their slidedeck. Hats off to Netflix and Limelight for this.